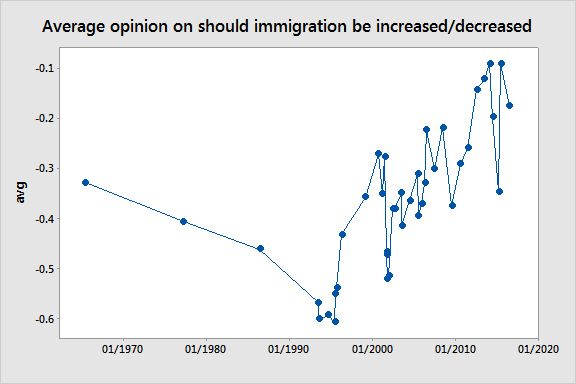 In June 1965, the Gallup Poll asked "Should immigration be kept at its present level, increased or decreased?" (this was when the Hart-Celler Act was under consideration by Congress). The same question was asked once in the 1970s, once in the 1980s, and pretty frequently since 1993. There have been some variations in the way it was introduced (e. g., sometimes it is "In your view, should...") but they don't seem to make any difference. The figure shows average opinion, counting increased as +1, decreased as -1, and present level as zero, for people who expressed an opinion. 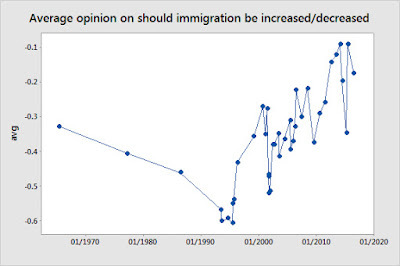 My initial impression was just that there were always more people in favor of a decrease than an increase, but when I graphed the data I realized that there was a definite pattern: more support for a decrease until the mid-1990s, and then increasing support for immigration after that time. 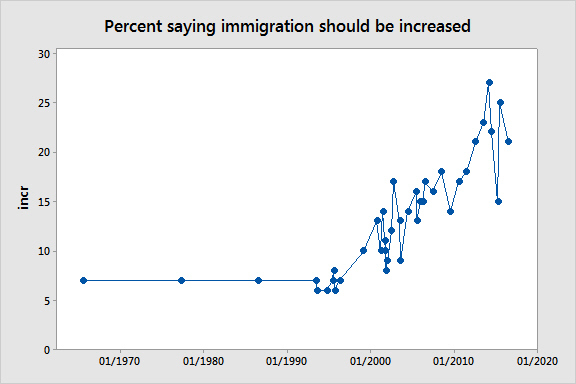 There are some ups and downs, notably a drop in support for increased immigration after 9/11, but the trend after the mid-1990s is clear. Before the 1990s, almost all of the change in the average involved a shift from staying the same to decreased--after that time, much of it involved a rise in the number of people saying it should be increased. Would you vote yes or no on a bill in Congress to let 100,000 selected European refugees come to this country in each of the next four years, in addition to the 150,000 immigrants now permitted to enter every year under our present quotas? In general, do you think the United States is letting too many immigrants come into this country, or not enough? Do you think the number of immigrants allowed to enter the U.S. each year should be increased somewhat, decreased somewhat, or kept at about the present level? President (Lyndon) Johnson has proposed that the immigration laws of this country be changed to allow more people into the United States as immigrants. From what you know or have heard, do you favor or oppose letting more people come to the United States as immigrants? I am a professor of sociology at the University of Connecticut, and editor of the journal Comparative Sociology. My book, Hypothesis Testing and Model Selection in the Social Sciences, was published by The Guilford Press in April 2016.